Originally I was going to go with 4 stars, but I realized that just because I loved the last 100 pages of the book doesn't mean that it was a 4 star read for me. 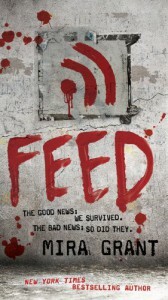 Feed is a good book. If you like books full of detail and intricate story, you're going to love this one. If you like reading about rebellion and the strength of human spirit fighting for survival and justice in a post apocalyptic world, this one's going to be right up your alley. If you prefer a story that unfolds in bits and pieces and not all at once, you're going to jump for joy at this book.Unfortunately, my ADD doesn't let me focus for too long, so if there isn't action until the end of a book, I find myself drifting.FEED had a lot of positives though. The bloggers have taken over and are the true source for information. Bloggers are the source. They are the heart of what is going on. They are the ones on the front lines, finding out what you need to know. This spin was creative and fun. I enjoyed reading the characters' blogs. Another big positive was one outstanding character. Shaun is the man. He's funny, caring, serious, smart...I could go on. I'm glad that he'll be in the next book. I also give credit to the author for creating a world where not everything has completely died simply because zombies are on the loose. I like that there are ways for people to get around and function, and that not everything has stopped in its tracks. Sure, there are new procedures and guidelines. Yes, there are places you just can't wander into. But, the whole world has not ceased to exist, even with the threat of disease and decay. The world has just changed, and we have had to adapt to it. We're participating in Survival of the Fittest. And it looks like we may be the ones to come out on top someday. Determination may end up being enough. I will read the next book, especially since I hear it has more action for me (yay!). I might take a small break before tackling it though.